Last Friday night, my bestie and I headed out for dinner with our boyfs on a little double date. We’d heard amazing things about The Market Pub in Chesterfield and it had been on both our lists for a while so we decided to give it a try. The Market Pub is situated in the town centre, just next to the market (as the name would suggest!) so it’s really easy to get to, and easy to go for a few drinks after dinner. First impressions of the pub weren’t amazing…in fact, we thought at first that we may have got the wrong place! The pictures on their website and Instagram page show really amazing food that wouldn’t be out of place in a classy restaurant but the pub was really…well, pub like! It was really busy, which is always a good sign, and in the dining area, the tables were crammed close together to fit plenty of people in. There was also a bit of a rowdy crowd which I guess is typical of a Friday night pub. Everything was a little bit old and run down and we exchanged sceptical looks between ourselves as we had to ask for menus at the bar. We were kind of just shown to our table and then left. We ordered a bottle of prosecco between us, which was really nice and I was really pleased that the glasses were really clean and had a raspberry in them (relief!). However, I did think that for the kind of pub it was, the prosecco was slightly on the expensive side. The menu is absolutely huge with plenty of choice including fresh seafood, an extensive list of burgers, four or five different pies and even some healthy choices, if you’re that way inclined (I’m not!). When our food arrived, all our worries about The Market Pub were put aside – the food was amazing! 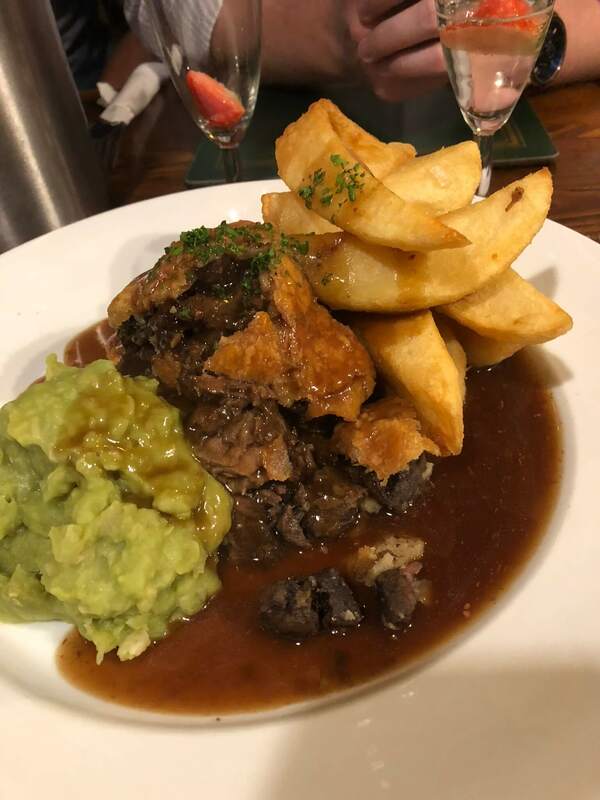 I went for the venison and mushroom pie which was packed full of meat and came with really thick cut chips and mushy peas, and the boys sampled some of the burgers. The pie was delicious but I must say, the burgers were to die for! Really tender and full of flavour plus you can pick from loads of different toppings. The boys went for black pudding, stilton and chorizo and mac and cheese. The food prices were pretty reasonable as well with the pies being under £10 each. 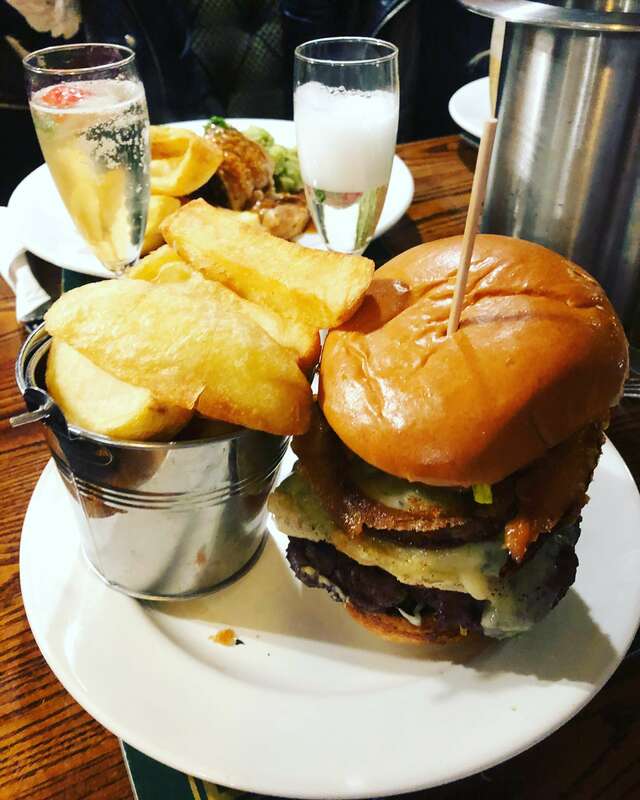 I’d definitely recommend The Market Pub for dinner – just don’t be put off by looks! The Market Pub has also just won Chesterfield Gastro Pub at the Chesterfield Food & Drink Awards 2017 so you’ll be eating at an award-winning establishment! Find out more about The Market Pub in Chesterfield here.